A commemorative Boy Scouts coin just moved closer to becoming reality. On May 15, the House of Representatives passed H.R. 5872, an act "To require the Secretary of the Treasury to mint coins in commemoration of the centennial of the Boy Scouts of America, and for other purposes." They did so with strong bipartisan support similar to their very recent passage of the palladium Saint-Gaudens double eagle coin legislation. Although 8 Democrats voted against the bill, they were easily overwhelmed with the support of 215 Democrats and 186 Republicans. Legislation must now pass in the Senate and then get signed by the President to become law. H.R. 5872 is officially entitled the Boy Scouts of America Centennial Commemorative Coin Act and calls for 350,000 silver $1 coins to be minted in 2010. The collector coin would contain 90% silver and 10% copper. Will H.R. 5872 become law? In the 110th Congress, 248 members of the House of Representative and the Senate have participated in Boy Scouts of America as Scouts or adult leaders. That along with its nearly unanimous "yes" vote in the House is extremely promising. To be fair, there are dissenters. It’s not about commemorating the Boy Scouts of America, but for the section in the bill that would mandate a $10 surcharge for the sale of each coin for the National Boy Scouts of America Foundation. For a perspective of the argument, visit the Dissident Voice article, Congress’s $3.5 million “Bake Sale” for the Boy Scouts. CoinNews readers have shown strong support for the coin as well. Check out some of their recent comments. I’m not a coin collector, but I am a Scout volunteer, and I think this is a wonderful way to celebrate 100 years of the Boy Scouts of America. Rep. Sessions is also sponsoring a letter to the Postal Service asking them to issue a 100th Anniversary of BSA commemorative stamp. 2010 will certainly be a special year for the Boy Scouts of America! Well said, Ted. With only 350,000 minted, and millions of Scouters nationwide, this is sure to be a popular issuance. As a professional Scouter I am ecstatic to hear about the minted coin. The idea of a commemorative stamp is also a great idea too. 100 years strong and many more years to come! I can hardly wait until the sale begins. Hopefully I will be one of the lucky 350,000. As a Scouter, I look forward to purchasing this peace of history. I am also eager to purchase the commemorative stamps–to save for the future and to place on mail to show support for this great organization. Being quite involved in Scouting and not a collector, nor having any idea how the distribution would go, how would one purchase these coins. They would be great gifts for scouts achieving the rank of Eagle. I have been a scouting volunteer for twenty one years and cannot wait for our one hundredth anniversary!!! It is wonderful for congress to recognize such an outstanding organization for our youth!!! Kudos to Congress and our wonderful volunteers!! my two brothers and I – and my two sons! Editor’s note: H.R. 5872 is now law. Both the House and Senate passed the legislation and President Bush signed it into law (Public Law No: 110-363) October 8, 2008. I am looking forward to buying a couple of these commemorative coins. I’m not a coin collector, but as a Boy Scout volunteer, I know the Centennial is a once-in-a-lifetime thing, and this coin will help me remember the occasion. From the sale of the coin, Tax money, my money, your money going to an institution that will not allow me, an Atheist into their ranks, nor do they allow Gay’s, I would have to say this is not a good thing. I was a Boy Scout, and they will not have me anymore. Separation of Federal dollars going towards an organization that outright discriminates and is religious based is always needed. They have the right to discriminate, but not the right to use my money to do so. The boy scouts of America is a private organization that is based on a Christian point of view. They discriminate against Homosexuals, and Atheists. 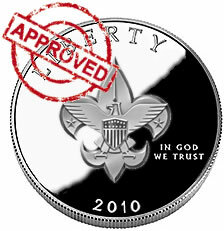 They are a private organization so I am not mad about that, but this Scout coin is a government mandated fund raiser for an organization that discriminates against the said people. This is wrong. This is the United States government funding bigotry. That is why I will not buy this coin, and I will do all I can to get it off the market. I don’t beleive 350,000 coins will come close to filling the demand. There has been over 115,000,000 youth who have gone through this program since 1910. The present annual registration of youth members runs about 5,000,000 each year with many millions more alumni sitting in the shadows. Just a thought. HOORAY!! IT’S ABOUT TIME WE HONOR BOYS WHO DO NOTHING BUT HELP THEIR COMMUNITY AND OUR NATION. WE’VE BECOME AN “IT’S ALL ABOUT ME” NATION. MOST THINK THEY DON’T HAVE TO GIVE BACK, ONLY TAKE. THESE YOUNG MEN MEAN NO HARM TO ANYONE, I KNOW THIS FIRST HAND. MY SON WILL BE AN EAGLE SCOUT THIS FALL AND I HAVE VOLUNTEERED FOR THE PAST 8 YEARS IN HIS CUB SCOUT PACK AND THE BOY SCOUT TROOP. THEY TRUELY AIM TO SERVE AND HAVE LEARNED TO BE DECENT, HONEST, HARD WORKING YOUNG MEN. SO LEAVE THEM AND THE ORGANIZATION ALONE. IT WORKS!!!! AND IF YOU DON’T LIKE THE ORGANIZATION, DON’T SUPPORT US, WE’LL MAKE OUT JUST FINE. AND BY ALL MEANS DON’T BUY THE COIN, THAT WAY THERE WILL BE PLENTY TO GO AROUND FOR THOSE YOUNG MEN AND THE MEN BEFORE THEM THAT IT HONORS. Government funds for a private club that is religious in origin and discriminates? Just say NO! You are not kicked out of Planned Parent Hood for being Atheist or gay. Do you see the difference? While both organizations receive federal funding, Planned Parent hood can’t discriminate based on religion (or lack of religion). I love boy scouts! So one organization doesn’t do means the other doesn’t as well? Please think before you post. “While both organizations receive federal funding”. They do? The last I check BSA received no federal grants (free money). It would be awesome if the “federal” government gave the Boy Scouts of America even 1% of the $305 Million of FREE money given to planned parenthood EVERY YEAR. Why is planned parenthood getting so much free money? This coin funds them. Also they are allowed to use federal buildings free of charge. Well Planned parenthood for one doesn’t discriminate against people. They preform a service for people (whether you agree with the service or not…which I will not say where I stand so we can stay on topic). Really Planned parenthood has absolutely nothing to do with the BSA or the issues behind the coin. I have no idea why it was brought up. Planned parenthood has nothing to do with BSA. It is only distracting from the main issue that we are discussing. That issue is that the BSA is getting funding from the Government. Equality, and freedom is what out government is supposed to protect. So why are they funding them at all? As I have said I do not care if they boy scouts let people like me in because they are a private organization; but when they receive government funding, no matter how small, I have find that wrong. I am not anti-BSA I am only advocating that the government stop funding the BSA. Now Planned parenthood has its problems, but whether or not it has funding has little to do with the BSA. If there are equality issues there then I say stop funding them as well.